Pallet racking is a fundamental part of any industrial warehouse; it serves as a necessary storage and organizational tool. Because of the absolute necessity of pallet racking to your everyday routine, having it safely installed and repaired by an expert is a vital part of keeping your operation running smoothly. Read on to learn more about the many uses for pallet racking and how S.W. Betz can help you get the pallet racking system you need today! Pallet Racking: What’s Right for your Facility? 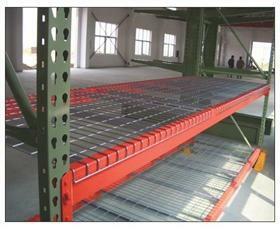 When it comes to maximizing the use you get out of your warehouse space, pallet racking is absolutely key. Even for warehouses that do not necessarily have a lot of square footage to spare, pallet racking allows you to take full advantage of the height of your building, using vertical space to store and organize different items as needed. If you do have a larger warehouse and have more floor space available, then pallet racking is still necessary, as it helps keep unwieldy items out of your path and clears the floor, making a neat, organized area that is easy to navigate. In addition to considering the size of your facility when purchasing pallet racking, you should also bear in mind whether you want to purchase new or used rack. S.W. Betz carries both new and used pallet racking; whether you want the load-bearing capacity guarantee of new rack or the cost-effective price of used, S.W. Betz can help you determine which will be the best pick for your company. Because pallet racking is so important, it is equally important that you have it repaired and serviced as needed. To maintain the organization and safety of your warehouse, call on S.W. Betz when you have a need of pallet racking repairs. This entry was posted on Thursday, October 9th, 2014 at 7:33 pm. Both comments and pings are currently closed.